The more itemized deductions you can rack up on you individual income tax return, the smaller amount of taxable income you will have which now puts more money in your pocket. Taxpayers who gave money or goods to a charity should be able to claim charitable contributions which get included as an itemized deduction on their 2017 federal tax return. For those taxpayers looking to make charitable contributions in 2018 for their 2018 taxes, the good news is that the 2017 Tax Cuts And Jobs Act made no changes to the deductibility of charitable contributions. So whether it is for 2017 or future years, here are some important facts you need to know about claiming charitable contributions to save on taxes and withstand an IRS audit. Qualified Charity. Only donations to qualified charitable organizations are deductible. Do not merely rely on the organization’s website or what the organization may state. If you are questioning whether an organization is qualified, you can check with IRS directly through the IRS website. To check the status of a charity, use the IRS Select Check tool. Keep in mind that religious institutions including churches, synagogues, temples, and mosques are considered “de facto” charitable organizations and are eligible to receive deductible donations even if they are not on the IRS’ website. However, you can never deduct donations to political organizations and candidates. Also, you cannot deduct contributions to specific individuals no matter how deserving or sympathetic to their tragic situation. You Must Itemize. To deduct donations, you must include these donations as Itemized Deductions on Schedule A of Form 1040. If the total amount of your Itemized Deductions does not exceed the Standard Deduction already given to you by the Federal government, you won’t get any real benefit from making these donations. Deductible Portion Of Donation May Be Reduced. You can only deduct the amount of your donation that exceeds the fair market value of the benefit received. If you get something in return for your donation, you would have to reduce your deduction by the value you received. Examples of benefits include merchandise, meals and tickets to events. Property donation. If you give property instead of cash, you can normally only deduct the item’s fair market value. Fair market value is generally the price you would get for the property item on the open market. Donating property that has appreciated in value, like stock, can result in a double benefit. Not only can you deduct the fair market value of the property (so long as you have owned it for at least one year), you will avoid paying capital gains tax. Donations From Your Retirement Account. Typically, if you want to make a donation from your IRA, you’d have to withdraw those funds, pay the tax and then make the donation. However, IRA owners who are age 70½ or older can transfer up to $100,000 per year to an eligible charity tax-free and the transfer counts toward your required minimum distribution (RMD) for the year. To be an eligible transfer, funds must be transferred directly by the IRA trustee to the charity. Withdrawing the monies first and then writing the check to the charity will not qualify for the non-recognition of income. Form to File. You would file Form 8283 for all non-cash gifts totaling more than $500 for the year. Keep an itemized list of for donations of non-cash items – do not just state you gave a bag of clothes and expect to substantiate the value of what you gave. Instead be specific, noting the description and condition of the items. You can generally take a deduction for the fair market value of the item which is the price that a willing buyer would pay to a willing seller. If you contribute property worth more than $5,000, you must obtain a written appraisal of the property’s fair market value. Description of any property given. Whether the donor received any goods or services in exchange for the gift. For cash donations under $250, you should always have substantiation of payment by a bank record such as a canceled check or credit card receipt, clearly annotated with the name of the charity or in writing from the organization. Even with a statement from the charity, it is still a good idea to retain this evidence of payment. You Can’t Deduct The Value Of Your Time. While your time is valuable, when you volunteer your time for charities, the IRS does not allow a charitable deduction for the time you spent. However, most out of pocket expenses relating to volunteering are should be deductible so long as they are not reimbursed to you or considered personal. Out of pocket charitable expenses which might be deductible include parking fees and tolls; other travel expenses; uniforms or other related clothing worn as part of your charitable service; and supplies used in the performance of your services. You will need to keep receipts evidencing payment in case you are questioned by the IRS. Timing Of Contribution. Contributions are deductible in the year the contributions are made so for the 2017 tax year that would had to been no later than December 31, 2017. But that doesn’t necessarily mean that by the 31st the cash payment had to be made out of your account. Contributions made by text message are deductible in the year you send the text message if the contribution is charged to your telephone or wireless account. Contributions made by credit card charges are deductible in the year charged so long as the charge is posted by your credit card company in that tax year. The credit charge itself does not have to be paid off by the end of the tax year it was charged. Similarly, checks which are written and mailed by the end of the year will be deductible for the year written if they are not cashed until the following year. Announcing that you intend to donate assets will not qualify for a deduction in the current tax year until the tax year you make good on the pledge. You know that at the Law Offices Of Jeffrey B. Kahn, P.C. we are always thinking of ways that our clients can save on taxes. If you are selected for an audit, stand up to the IRS by getting representation. Tax problems are usually a serious matter and must be handled appropriately so it’s important to that you’ve hired the best lawyer for your particular situation. The tax attorneys at the Law Offices Of Jeffrey B. Kahn, P.C. located in Orange County (Irvine), San Diego County (Carlsbad) and elsewhere in California are highly skilled in handling tax matters and can effectively represent at all levels with the IRS and State Tax Agencies including criminal tax investigations and attempted prosecutions, unreported crypto currency transactions, undisclosed foreign bank accounts and other foreign assets, and unreported foreign income. 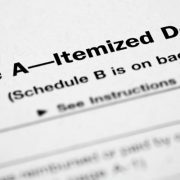 Itemized Deductions Or Standard Deduction? – Pick Your Tax Savings For 2017! On December 22, 2017, President Trump signed into law the 2017 Tax Cuts And Jobs Act. It’s been a good 30 years since the last time the Internal Revenue Code received such a major update. Among other changes, the new law increases the Standard Deduction For Individuals starting with 2018. But for 2017 tax returns, the old law still applies where individual taxpayers can still effectively choose to itemize or take the Standard Deduction. Most taxpayers claim the standard deduction when they file their federal tax return. However, some filers may be able to lower their tax bill by itemizing when they file their 2017 tax return. Before choosing to take the standard deduction or itemize, it’s a good idea to figure deductions using both methods and choose the method with the most benefit. If a taxpayer is 65 or older, or blind, the standard deduction is more, but may be limited if another person claims that taxpayer as a dependent. Starting in 2018 tax rates are lower so less of you will get to keep more of your income, a deduction is worth less. 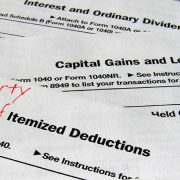 On top of that, several popular deductions are disappearing or getting substantially limited and in combination with a nearly doubled standard deduction, less taxpayers will be itemizing. 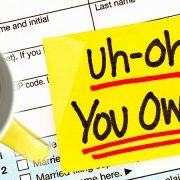 Limit On Deduction For State And Local Taxes – A taxpayer may claim an itemized deduction of only up to $10,000 ($5,000 for a married taxpayer filing a separate return) in (i) personal state and local property taxes, and (ii) state and local income taxes (or sales taxes in lieu of income taxes). Taxes paid or accrued in carrying on a trade or business are not subject to this limitation. Limit On Deduction Of Mortgage Interest – For mortgages incurred after December 31, 2017, taxpayers may deduct interest on up to $750,000 of principal (mortgages existing before January 1, 2018 are still subject to the pre-existing law’s $1 million limit). But for all taxpayers there is no longer a deduction for interest paid on home equity loans. Elimination Of Miscellaneous Itemized Deductions And Deduction For Moving Expenses – A taxpayer can no longer deduct miscellaneous itemized deductions which include unreimbursed employee expenses and tax preparation costs. Also the deduction for moving expenses is gone. You know that at the Law Offices Of Jeffrey B. Kahn, P.C. we are always thinking of ways that our clients can save on taxes. If you are selected for an audit, stand up to the IRS by getting representation. Tax problems are usually a serious matter and must be handled appropriately so it’s important to that you’ve hired the best lawyer for your particular situation. The tax attorneys at the Law Offices Of Jeffrey B. Kahn, P.C. located in Orange County (Irvine), South Los Angeles County (Long Beach) and elsewhere in California are highly skilled in handling tax matters and can effectively represent at all levels with the IRS and State Tax Agencies including criminal tax investigations and attempted prosecutions, undisclosed foreign bank accounts and other foreign assets, and unreported foreign income. On December 22, 2017, President Trump signed into law the 2017 Tax Cuts And Jobs Act. It’s been a good 30 years since the last time the Internal Revenue Code received such a major update. Compressed And Lower Income Tax Rates For Individuals. The tax rates are going down next year, so a deduction now is worth a lot more than it will be in 2018. On top of that, several popular deductions are disappearing next year or getting substantially limited and in combination with a nearly doubled standard deduction, less taxpayers will be itemizing deductions in 2018. The key here is to accelerate deductions into 2017 and defer income into 2018. 1.Give more to charity in 2017. In addition to the usual dollar donations to charities, religious institutions and educational institutions, consider clearing your home of those unwanted household goods and clothing to give to charities. Many groups will accept these items even vehicles, with some even making arrangements to pick up them up from your home. You may also consider to donate stock or mutual funds that you’ve held for more than a year but that no longer fit your investment goals. The charity gets the asset to hold or sell, and your portfolio re-balancing nets you a deduction for the asset’s value at the time of gifting. Even better, you do not have to worry about capital gains taxes on the appreciation of your gift. Remember that if you take the standard deduction in 2018, you won’t get any tax savings from your charitable contributions made in 2018. 2. Make the most of your home – mortgage interest. Home-ownership provides a variety of tax breaks, some of which you can use by year-end to reduce your current year’s tax bill. Make your January mortgage payment by December 31st and deduct the mortgage interest on your coming tax return. In 2018, the amount of mortgage interest you can deduct will be reduced (from $1,000,000 of principal indebtedness to $750,000 of principal indebtedness) so you will want to maximize the amount of mortgage interest paid in 2017. Another tactic is to try to prepay your home-equity loan interest. That deduction goes away next year, so it’s worth calling your bank and seeing if you can prepay at least some of the interest so you can get the tax savings in 2017. 3.Make the most of your home – property taxes. Like prepaying mortgage interest, the same tactic will apply for property taxes which along with other state and local taxes will be deductible only up to $10,000 starting in 2018. 4.Pay State And Local Income Taxes in 2017. Starting in 2018 property taxes and other state and local taxes will be deductible only up to $10,000. People who typically pay their state income taxes quarterly can easily pay the January installment before the end of 2017. Likewise if you have an outstanding income tax bill with your state or local tax agency or expect to amend a prior year’s state income tax return that will result in you owing money, consider paying or prepaying these liabilities in 2017. 5.Pay your self-employed business expenses now. If you are self-employed, you should accelerate payment of your business expenses in 2017. 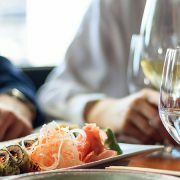 Recognizing these expenses in 2017 when tax rates are higher will provide you with a greater tax savings. 6.Catch up and prepay your “miscellaneous itemized deductions”. If you pay union dues or a professional society membership fee (e.g. a chamber of commerce or bar association) or buy a lot of supplies for your job (e.g., professional musicians buying new instruments) that you normally deduct as miscellaneous itemized deductions on your taxes, you’ll want to buy everything you can by January 1st. All of these expenses constitute Miscellaneous Itemized Deductions which are deductible to the extent the total is more than 2% of your adjusted income. But that deduction is going away entirely in 2018. Another deduction that’s going away in 2018 is for tax preparation services. Ask your accountant now for the invoice they would normally give you in April after they file your tax return. If you can pay it now, you can still deduct it. 7.Defer your income into 2018. Consider delaying income until January 2018 when the tax rates are lower, especially if you are a small-business owner. So if you are chasing up some customers or clients to pay the bill you sent them a while ago, you might want to wait until January to get aggressive on collecting. Consider delaying the delivery of invoices for year-end jobs until January 2018. In addition to lower tax rates, small business owners get a generous benefit starting next year of being able to deduct 20% of their business income tax-free. If you are an employee, ask your boss to hold your bonus until January. Individuals should also consider putting more money into a tax-deferred workplace retirement plan in 2017 and hold off on selling assets that will produce a capital gain until 2018. But Beware Of The Bite Of The Alternative Minimum Tax! 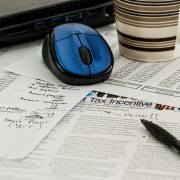 If you will be subject to the Alternative Minimum Tax (“AMT”) in 2017, paying those state and local taxes, your property taxes, and your miscellaneous itemized deductions before this January 1st probably won’t help you because the AMT requires you to add back all of these payments and recalculate your tax bill, so the benefit of paying them in 2017 goes away. 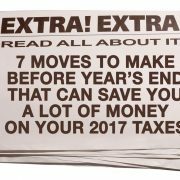 With not much time left in 2017 you will need to act quickly on those tax moves that are easy to accomplish to reduce your tax bill. You know that at the Law Offices Of Jeffrey B. Kahn, P.C. we are always thinking of ways that our clients can save on taxes. If you are selected for an audit, stand up to the IRS by getting representation. Tax problems are usually a serious matter and must be handled appropriately so it’s important to that you’ve hired the best lawyer for your particular situation. The tax attorneys at the Law Offices Of Jeffrey B. Kahn, P.C. located in Orange County, San Francisco and elsewhere in California are highly skilled in handling tax matters and can effectively represent at all levels with the IRS and State Tax Agencies including criminal tax investigations and attempted prosecutions, undisclosed foreign bank accounts and other foreign assets, and unreported foreign income.